Situated 30 miles east of Inverness, Cummingston is a semi tidal sea cliff of soft sandstone overlooking the Moray Firth. 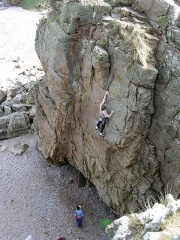 The style of the climbing is typified by strenuous moves on pockets, pinches and slopers. Cummingston village lies on the B9040, the coastal road from Burghead to Lossiemouth. Travelling from the west, follow the A96 until reaching a large roundabout east of Forres. Take the left turning signposted Findhorn, Burghead and RAF Kinloss (B9011). Follow this ignoring the turn-off to Findhorn and drive through RAF Kinloss on the B9089. About 9km beyond Kinloss, follow the B9089 taking a sharp junction left (just beyond a humpback on the road) to head towards Burghhead. Turn left at the next junction and just before Burghead turn right onto the B9040 to reach Cummingston. Travelling from the east, avoid Elgin by taking the B9103 to Lossiemouth leaving the A96 0.6 miles after the second roundabout bypassing Lhanbryde and approximately 2 miles before Elgin itself. At Lossiemouth follow the B9040 west along the coast through Hopeman and on to Cummingston. Travelling from the south, the quickest route is to leave the A9 at Aviemore drive to Carrbridge on the B9153, and turn right (eastwarards) along the A938.After a couple of miles take the B9007 on the left and follow this across the moors and small village of Ferness to intersect with the A940 road to Forres where it joins the A96.Take the route to Cummingston as described above leaving the A96 at the roundabout east of Forres. For access to the cliffs once at Cummingston, look out for a white war memorial with a cross on top. This is roughly in the centre of the village. Turn left at the turning 100 metres east of the memorial (Sea View Road). Then turn left and then right to reach an unsurfaced car park overlooking the sea. A kiddies play park and a couple of Portaloos are conviently on hand for a day out with the family. Any restrictions or Bird bans? Superb balancy moves up the arete, sort of low in the grade. There are lots of traverses as well as up problems but even on low level traverses care must be taken with the landings, so a spotter and a bouldering mat are recommended. Due to the softness of the rock nothing more abrasive than a toothbrush should be used to clean the holds. The sea can affect not only the landings but also the problems themselves by shifting the beach level markedly in some instances. This page was last modified on 11 June 2008, at 22:46.